So I've finished Assassin's Creed 3 and thought it was time to do a continuation of my series of posts about the game series. I'll start by providing my honest opinion of the game; Assassin's Creed 3 is unequivocally awful. It's a terrible game with poor pacing, bad writing, a dull protagonist, and tedious gameplay. I'm going to throw in some mild spoilers here (for the first few hours of the game), but it's nothing that you probably wouldn't pick up anyway, nor anything worth crying about if you haven't played it. So the game starts off with you playing Desmond Miles trying to prevent the end of the world, as part of the ongoing "main" plot of the game. It's still as vague and poorly developed as ever, and at this point, the whole charade is just starting to get a little tired. The snippets we get of the modern day conflict were enough to intrigue for a little while, but continuing to attempt to string people along with vague and indistinct hints and suggestions can only last so long before there's a backlash. We've reached the point where it's no longer interesting, and it just comes across as attempt to sound mysterious without the writers having to actually put in any real effort. Now, I assume that the writers have put in some effort, which just makes this problem even worse because they're withholding information in order to seem brilliant, when all they're achieving is the opposite effect. 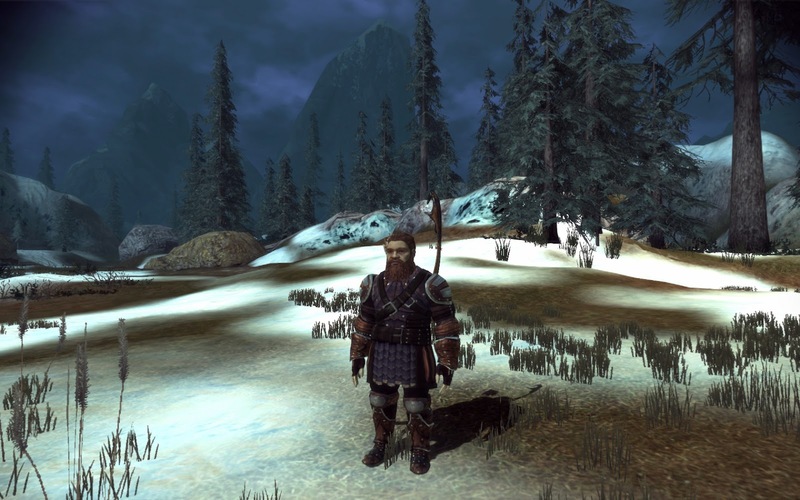 This is the fifth game in the series - it's time to stop ignoring your "main" storyline. 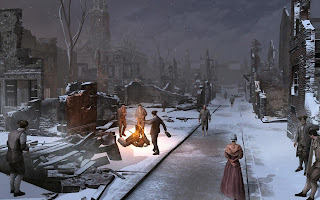 The three snippets of modern day gameplay with virtually no plot development are not sufficient to maintain interest at this point in time. Something needs to happen, but what does end up happening is so overblown that it just comes across as cheap. "The results are in, guys... we're boring." The guts of the "real" game is set around the American revolution, where you fight against the evil British loyalists... err, templars. Seriously, this couldn't be attempting to appeal to American national pride any more if it tried. There's a few token things to try and paint George Washington in a less than favourable light, but there is an awfully large amount of "kill the evil British", which is supposed to be offset by some of this characterisation and the constant humor laden jabs at the US in animus database entries, which I'm guessing a lot of players will never read. There were some minor laughs to be had in that content, which was possibly the highlight of the game. Reading those was one of the few places in the game where I actually was engaged and even amused. 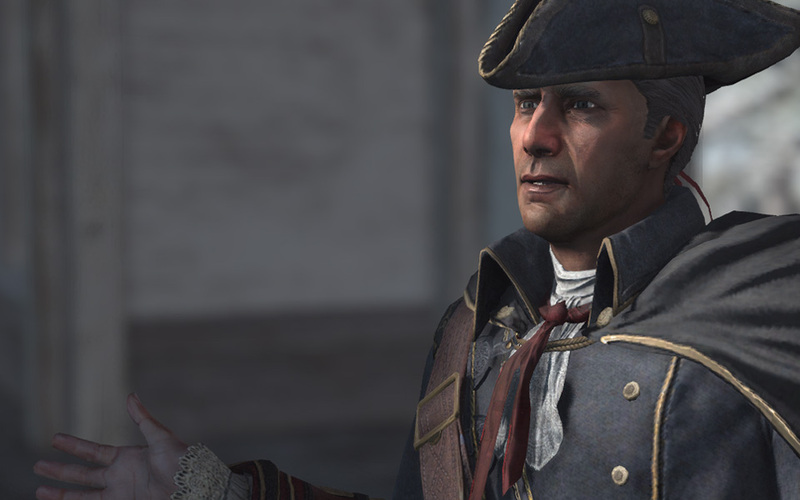 When you get dumped into the animus, because apparently that's the way templars and assassins solve every problem, you start off playing as one Haytham Kenway, in what are possibly some of the most boring hours of gameplay of any Assassin's Creed game. 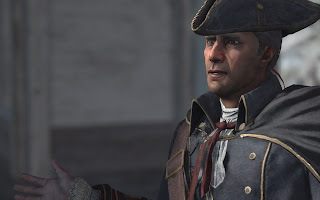 There are constant cutscenes, pre-ordained actions, and missions that feel less like an introduction to the game and more like filling time just so you get some characterisation of Haytham and his associates before the completely unsurprising reveal that Haytham is actually a templar. For some reason, everyone is shocked by this revelation, even though it was shown in AC2 that Altair married and had children with a former templar. Whoopeedoo. What's more is this reveal is made fairly obvious through some of the dialogue, and stated outright if you actually read the animus entries as you're playing. Well done to the QA team for dropping the ball on that one. The whole first few hours of the game set the tone for the game as a whole, and it is that AC3 isn't about assassinations... it's about cutscenes and faffing about. "What was that? Sorry, I couldn't hear you over the sound of my smug self-satisfaction. " After that's done, you start playing as Connor, part of an Native American tribe (he has a native name as well, but that mercifully gets dumped soon into the game) who eventually becomes an assassin. You do have to deal with playing him as a child and a teenager first, which I think is supposed to make him feel more like a real character. Unfortunately, it means you get a lot of tedious dialogue in long, drawn out native language, which is just plain dull. 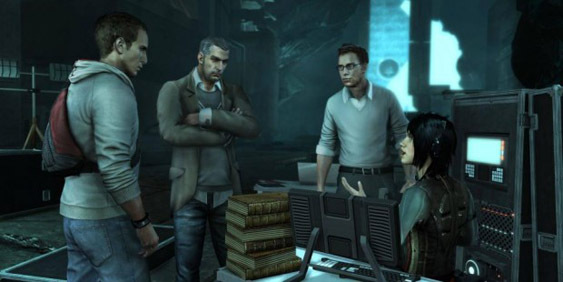 It's been stated previously that the animus does translations - any foreign language has been short and for emphasis, this seems to have been done just for the sake of reinforcing that Connor is a native, which is just unnecessary and makes any cutscenes with it plain dull. You did have to "come of age" in AC2 as Ezio, but this ascent was very short in comparison to AC3's multiple introductions, and handled in a far more engaging way. Playing hide and seek as a child isn't what players signed up for, and this kind of boredom is indicative of the game as a whole even once you do become an assassin. Playing checkers or various other board games are another way the game artificially pads out its running time, but they simply aren't interesting. The series standard gameplay of "collect trinkets from around the world" is back, this time in the form of feathers, almanac pages (which move and potentially disappear if you don't get them in time) and peg leg trinkets (which can be placed in frustratingly difficult to find and reach places). Homestead missions are typically simple fetch quests, or something equally tedious. The worst case was where one man was asking for help to woo a woman. So Connor asks the farmer's wife for advice, who tells him to fetch some flowers. So the player must climb a cliff, pick flowers, then return to the man... and they are treated to a cutscene where the man is in an outhouse. That's right, the game has the protagonist having a conversation with someone in a toilet. There are various other delivery missions, and the ability to set up trade routes, but their only purpose is to make money, and as with previous games, there's little point to having money, because it's fairly easy to acquire enough for everything you need or want to buy. Say hello to Connor's housecarl mentor, Token Achilles Davenport. The assassin recruit and mission interface is unintuitive to the point of stupidity - you have to hold down a button in order to keep the damn thing up, except when you switch to the mission menu, because then you can let go. The weapon changing interface now has a lag as it switches screens, instead of having a neat overlay like ever game before, and it now uses a column setup instead of a wheel interface, which is significantly slower. The game offers "interactive conversation" markers on the map now, though apparently the game designers aren't aware of the meaning of the word "interactive". These are interactive in the sense that you walk up to the person, hit a button and then that person and Connor have a conversation without any input from the player. Then there's "hunting", which unlike hunting in Red Dead Redemption, offers virtually no danger because all the animals that can actually hurt you can be defeated through straightforwardly boring quicktime events. According to many "professional" reviewers, there was something extremely satisfying about leaping from trees to use your hidden blade to kill a hare. I'm sorry, I thought this was Assassin's Creed, not kill-defenseless-animals creed. I guess I forgot that I wanted to sign up with something that actually had entertaining gameplay. Then there are the naval missions. 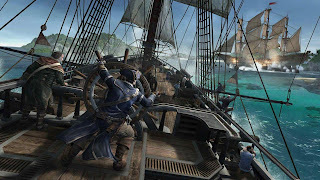 Now, I loved playing Sid Meier's Pirates!, so I love some good ship combat. However, much like the rest of the game, AC3's ship combat gets repetitive and boring after only a few tries. It's a whole lot of circling around, then holding down and releasing the controller trigger to launch cannonballs. The strategy never really evolves beyond a basic level, and your assistant yells the same handful of lines at you over and over again to the point where you're inclined to mute the sound simply so you don't have to listen to him. It's basically a worse version of Pirates, and from a camera viewpoint that makes it hard to see what's going on. If you want ship combat, just go find yourself a copy of that - it'll be a lot more fun. "I cannae take it any more, cap'n!" 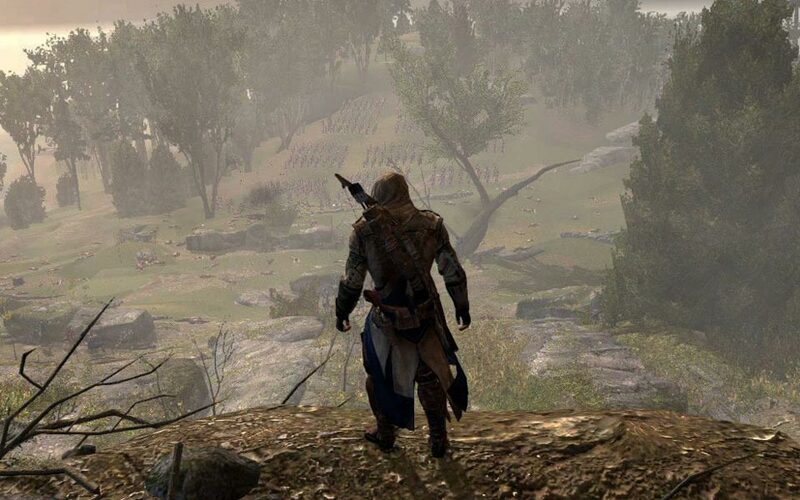 What is perhaps most disappointing about AC3 is that the setting and the realisation of it is just fairly uninteresting, both of which have been highlights of the series to this point. The architecture simply doesn't compare to that of the previous games, and it's painfully obvious that the designers and art team have realised this at some point during development. Instead of massive sweeping shots that gloriously showcase the landscape and the art of the gameworld that used to be the reward for reaching a viewpoint and hitting that "synchronise" button, you get a short scene involving a couple of sharp camera sweeps, and Connor ends up occupying half the screen for a significant period of that. Even outside of this, fog and haze that obscures your view is commonplace, limiting the vista that you get to see, ensuring that you can't see the extent of the flat and monotonous art from above. While this is partially a result of the time period, the designers did choose this setting. It might be realistic, but that doesn't mean that it's not boring. The PC version appears to be slightly better in this regard, but it's still a clunky and poorly optimised port. The protagonist is both bland and unlikelable; the few times Connor attempts to display a personality, he's simply whining or complaining about how the person who taught him everything he knows was completely useless. The game effectively wants you to be invested or care about the American Civil War without providing you with any reason to do so. The massive focus on this aspect of history is out of place in comparison to previous games. Though they brought in elements of history and had the protagonist playing a role at the edges, Altair and Ezio were never so heavily involved, and it was never the core focus of the entire narrative. It feels less like the story of the protagonist and more like an exercise of attempting to shoe-horn in as many famous battles, people and locations from the civil war as possible in order for that to be a drawcard. As a result, the game just winds up feeling like a postcard history tour of the period rather than an actual story. Ubisoft pretty much expects you to be impressed and engaged by that story and their telling of it, because they keep shoving cutscene after cutscene in your face. This is the first game I've ever played where I was getting bored and frustrated from too many cutscenes and felt the urge to skip them. I didn't because I kept expecting some sort of interesting plot development, but instead I just kept having to watch key moments of the game instead of getting to play them. I have never, ever felt this way about story and cutscenes in a game before, so the fact that I wanted to skip them should tell you something about how frequent and annoying they are. But players HAVE to love this battle... because... American History! Worse is that the main missions of the game don't really deliver anything particularly interesting. There's more than a few cases where you'll end up in a chase or just "travel from location a to location b", or even numerous occasions where the game forces you to WALK as part of a mission. That's right, it's an open world game, but occasionally you're forced to walk (usually at a slow pace) ... just because. There weren't any missions where you can think back and go "oh, that was memorable" - or if you do remember a mission, it was because the premise or the execution (or both) was stupid or annoying. The "optional objectives" that were also in the last two games have returned, but just like in Revelations, there's no reward for completing them, only the impression of punishment if you fail to achieve them. They range from the utterly trivial to the very difficult; and that's presuming that there's not some strange bug that can cause you to fail one of them when you shouldn't, which will likely happen at least a couple of times for many players. The game also has a number of assassinations end via cutscene; the game sees a return of death monologues as per AC1, though they're slightly shorter, so that's at least a slight improvement. Arguably the worst assassinations/cutscenes are the ones where deaths happen via... well, they're not so much quicktime events as... events. Numerous times during the game, you'll end up with a cutscene and the game will just stop, and a button will come up on screen, i.e. press X. Except in AC3, it's not "press X to not die", it's "press X to continue." If you don't press X, nothing happens. This is possibly the single most stupid design idea ever created in gaming, and any designer that thinks it is a good idea needs to actually go play some games that have actual gameplay. This isn't even lazy design, it's just plain awful. There is so much filler content thrown into the game that the designers appear to have forgotten to how to actually make their game fun. Connor can't even kill civilians now, which while a great way to prevent that annoying occurrence where you would end up stabbing an innocent instead of a target, means you no longer have to be careful when hunting a target in a crowd. Now if you hit assassinate near a civilian, Connor just brandishes his blades, which while great for not drawing attention, is a loss for the game overall because it reduces the challenge and the feeling of freedom in the game. The player feels more hand-held and directed than ever before, which just robs the player of freedom. Most missions almost have to be completed in a certain way, particularly if you want to achieve full synchronisation, meaning there is one true way to complete a mission instead of allowing the player to make choices and pick their own means to success, which is a staple tenet/expectation of open-world games. Even the free running in the wilderness along the treetops dictates an almost linear path rather than allowing the player freedom to navigate as they wish. In Boston and New York, I spent most of my time running around on the ground, because there was little point getting onto the rooftops as it wouldn't take long before it was impossible to keep travelling in the direction I wanted without jumping back down to the street. Parkour? No, players don't want to do that anymore, it's not like it was a key part of the series. 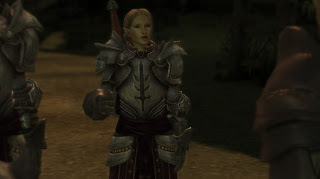 This lack of freedom and blatant hand-holding applies to combat as well, where you get big attack signals pop up over enemies, and for the most part, combat becomes very straightforward once you work out the new pattern of combat - which is different to the previous four games in the series. I don't know how the designers simultaneously managed to make the combat more complicated yet more trivial, but they succeeded. It's trivial apart from a few select enemies that will pretty much counter anything that you throw at them, leaving you two options - stealth kills/assassinations, or shooting them with a firearm. You could also use one of your various gadgets, but then you'd have to switch to your inventory menu screen, and that's a tedious mess that takes time to bring up and navigate instead of the instant overlay of previous games, so you simply won't bother. I should commend the animations in combat, which are fluid and impressive, as are the new climbing and parkour animations, but these do little to redeem the game except occasionally provide a brief "that looks cool" moment when Connor performs a counter on two enemies simultaneously. The notoriety and alertness system has also been reworked, and as a result, occasionally you'll suddenly find yourself being chased by guards for no apparent reason. Escaping from enemies is now slightly more difficult due to glitchy line of sight issues. You'll be hidden, but as you jump into haycart, your arc takes you up to a height where a guard can see you, thus you're classed as being "seen" so can't hide in the haycart. Occasionally you'll be able to successfully jump into it on the third or fourth attempt, so sometimes it's worth trying that hiding spot multiple times. Hiding spots are also less frequent than before, and they don't show up on the minimap, so most of the time it's actually more practical to just flee the search radius or kill or the enemies trailing you. It is important to be careful with the latter, however, as once you hit maximum notoriety, enemies will spawn almost constantly, leaving you with no recourse to escape. Furthermore, since this means that enemies attack you on sight, it becomes almost impossible to use the two mechanisms marked on the map to reduce your notoriety (because you can't use them if you're being chased), forcing you to run around the city with a cadre of guards in tow, trying to find and rip down posters to reduce your notoriety to zero before fleeing the search radius of the enemies chasing you. The whole scenario is so ridiculous that it almost feels as though it should be accompanied by Yakety Sax. Who knew that all the British Regulars had incredible parkour skills? 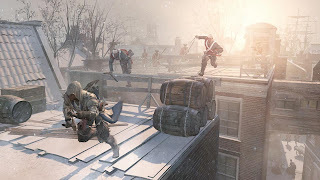 All in all, there is nothing about Assassin's Creed 3 that is an improvement on the previous games, and almost everything feels like it has gotten worse. I rarely, if ever, felt that I was having fun. I was going through the motions and waiting and expecting to have fun, but it never happened because the game was just so awful. I don't know if it was produced by an entirely different team to the previous games, but it just felt like the whole thing was phoned in and written by a group of high school history students with no knowledge of game design. In essence, it's still an Assassin's Creed game, so it should be fun, but the fact is that there are so many annoyances that game introduces that just add up to the whole package being bland, tedious, and outright annoying. Don't buy this game, not even if it's on sale. It's not worth your money or your time. At most, read a plot synopsis or watch a video of the ending. I don't like saying this, but AC3 is simply a terrible game from start to finish. I realise that I've been less active on this blog of late that I would like, and probably less active than I should be. This is partly because I've been slightly busier than usual and been able to dedicate less time to blogging and modding than I would like, but also because a lot of the modding work I've been doing lately for The Shattered War hasn't been terribly interesting for people to read about. Why is that? Mainly because a lot of the work has either been testing and fixing bugs, or writing dialogue scripts. Dialogue scripts are the text files that get sent to voice actors once a role has been filled. This is a test file with a full export of all the character's lines, but heavily annotated. It provides a character biography, so the voice actor has an insight into their personality. It has any background information on the lore or setting that people may not be familiar with that is relevant to the character and their dialogue, along with details of any plots/storylines that the character may be involved with. It also contains a pronunciation guide for the names of other characters or locations. Finally, the lines are divided up into logical segments to indicate the structure of the dialogue, and also an indication of the character's emotions or thought process behind the line is provided. This allows the voice actor to inject their own skill and take on the character's personality, while remaining true to the core persona with which the character has been written. 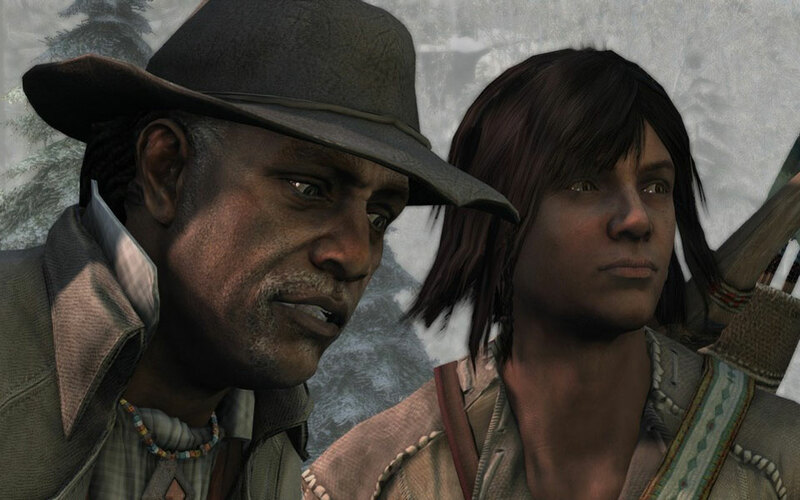 There is a delicate balance here - being too prescriptive doesn't allow the voice actor to act properly or give a good range of emotion and characterisation, but too little information and the voice actor may convey something completely different from what is meant in the context of the conversation or situation. However, all the dialogue and all the scripts for the entire mod have been written, so I'll be running open auditions for all roles until they're filled. If you're at all interested in providing voice acting for any of the characters in the mod, please check out this page for details on characters and how to audition. I'll endeavor to get back to more regular updates of progress on The Shattered War, it's been a very long journey of development thus far, and there's still a substantial amount of work left, but there will be quite a lot of gameplay to show for it once it's finished.